Using the world’s fastest supercomputer and a new scalable, ultra-low power computer architecture, IBM has simulated 530 billion neurons and 100 trillion synapses – matching the numbers of the human brain – in an important step toward creating a true artificial brain. 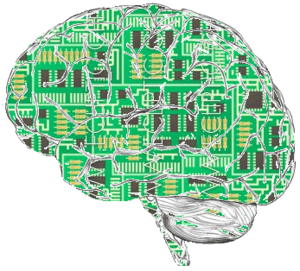 The human brain, arguably the most complex object in the known universe, is a truly remarkable power-saver: it can simultaneously gather thousands of sensory inputs, interpret them in real time as a whole and react appropriately, abstracting, learning, planning and inventing, all on a strict power budget of about 20 W. A computer of comparable complexity that uses current technology, according to IBM’s own estimates, would drain about 100 MW of power. Clearly, such power consumption would be highly impractical. The problem, then, begs for an entirely new approach. IBM’s answer is cognitive computing, a newly coined discipline that combines the latest discoveries in the field of neuroscience, nanotechnology and supercomputing. Neuroscience has taught us that the brain consumes little power mainly because it is “event-driven.” In simple terms this means that individual neurons, synapses and axons only consume power as they are activated – e.g. by an external sensory input or other neurons – and consume no power otherwise. This is however not the case with today’s computers, which, in comparison, are huge power wasters. The IBM engineers have leveraged this knowledge to build a novel computer architecture, and then used it to simulate a number of neurons and synapses comparable to what would be found in a typical human brain. The result is not a biologically or functionally accurate simulation of the human brain – it cannot sense, conceptualize, or “think” in any traditional sense of the word – but it is still a crucial step toward the creation of a machine that, one day, might do just that. The researchers’ starting point was CoCoMac, a comprehensive but incomplete database detailing the wiring of a macaque’s brain. After four years of painstaking work patching the database, the team members were able to obtain a workable dataset which they used to inspire the layout of their artificial brain. Inside the system, the two main components are neurons and synapses.